The title isn’t just a pithy phrase, I am feeling sheepish about sheep! As an Australian I’ve absorbed so much knowledge about sheep and wool. Australia’s history, sheep farming and wool are closely tied. My own family’s history is part of this story. Yet at the same time, I don’t know much about this topic at all! This post records what I’ve learnt so far. I’m quite sure there’s aspects I have left out, there may be some parts that are wrong. I’ll keep updating it as I learn more. Top left: a Lincoln sheep. Middle left to right: Corriedale, Merino, Richard Dennis. Like lots of other good things, sheep probably originated from Mesopotamia. Originally they were domesticated for their meat and milk. We can thank the Persians for breeding them for wool production. Talking to farmers, I discovered that they farm different breeds for a variety of reasons. Most importantly, they pick a breed that suits their environment. Poorly suited sheep get sick, which is bad for the sheep and the farmer. The reason why Merino is such a popular sheep in Australia? It copes well with our dry conditions. Victoria is wetter than the Australian average, so other breeds can be better suited to each farm’s microclimate. Some breeds are better for wool, others for meat, and a lot of the breeds listed above are suited to both purposes. As ruminant animals, sheep produce methane, which is a greenhouse gas. Alpacas produce methane too, but to a lesser degree. An industry funded lifecycle review doesn’t provide clear answers on other environmental questions. Where I live the rainfall is higher than most of Australia, and farms keep a low density of livestock. Because of that, the report suggests that water usage and erosion may not be big issues on the farm. Producing wool uses less energy than alternative synthetic fibres. Water and energy use are still significant issues during processing and dying. Scouring wool can use chemicals that interfere with natural endocrine systems. Treatments against moths and beetles don’t sound awesome either. It’s important to note that a lot of wool’s water use comes from consumers washing their own garments. No, this has nothing to do with donkey-horse offspring. Mulesing is a process undertaken to prevent flystrike, but it’s not very nice itself. Flystrike is one of the most common problems sheep suffer in Australia. Flys lay their eggs on the dirty wool near a sheep’s tail. When the eggs hatch, the maggots eat the closest meat they can find. Gross. Unfortunately for the sheep, mulesing prevents flystrike by cutting a crescent of skin below the tail off. This has been happening in Australia since the 1930s without anaesthetic, which has a lot of people upset. No doubt the sheep aren’t happy about it either. The practice is being phased out, but its replacement requires clamping the under-tail skin tightly until the connective tissue dyes and the excess falls off. I don’t know that I’m much happier about that solution either. Perhaps this is enough to put you off wool, and it was for me too until I talked to farmers of other sheep breeds. 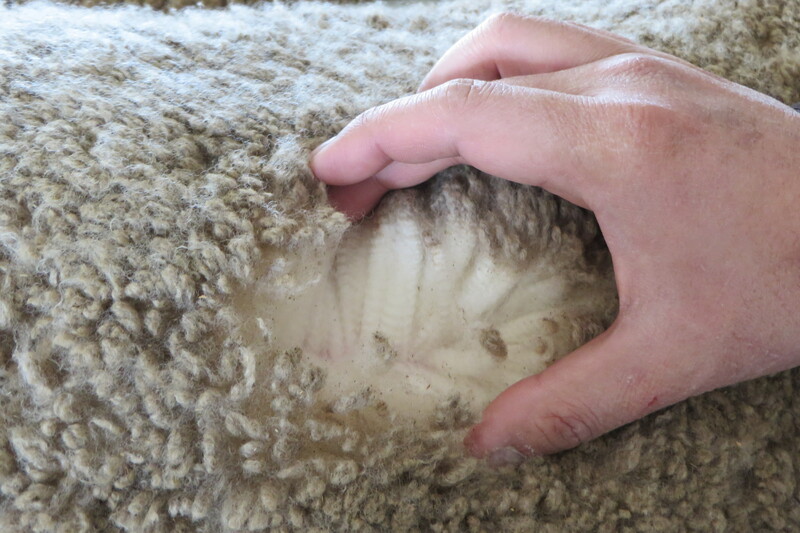 Mulesing is performed on Merino sheep because they have lots of rolling skin. 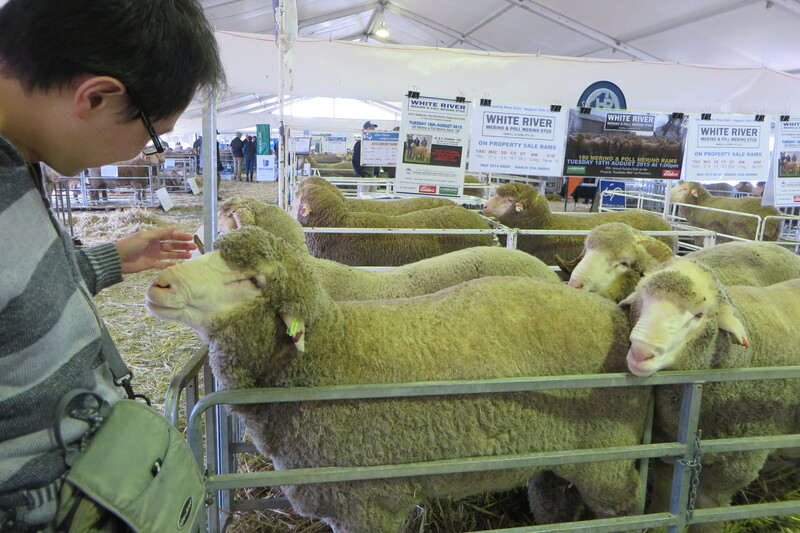 All that skin means more wool, but also makes Merinos susceptible to fly strike. Other breeds don’t have the same issues and some naturally are bare-breeched, so they don’t suffer fly strike at all. I was lax when I visited the farmers listed below and forgot to ask them about other steps they took to keep their sheep healthy. Sheep suffer from lice and worms, so I assume they undergo a similar vaccination schedule to alpacas. I’ll update this section once I’ve got more information. Sheep have been bred to be white for easier dying. Their ancestors were brown, and boutique flocks often run coloured sheep because they’re popular with handweavers, spinners and knitters. It’s possible therefore to get wool in white, cream, fawn, browns and shades of grey through to black. True black is rare; more often it’s a very dark brown. What colours you get depend on the breed and the individual animal. Fleece weight is dependant on breed, averaging around 4-6kg. 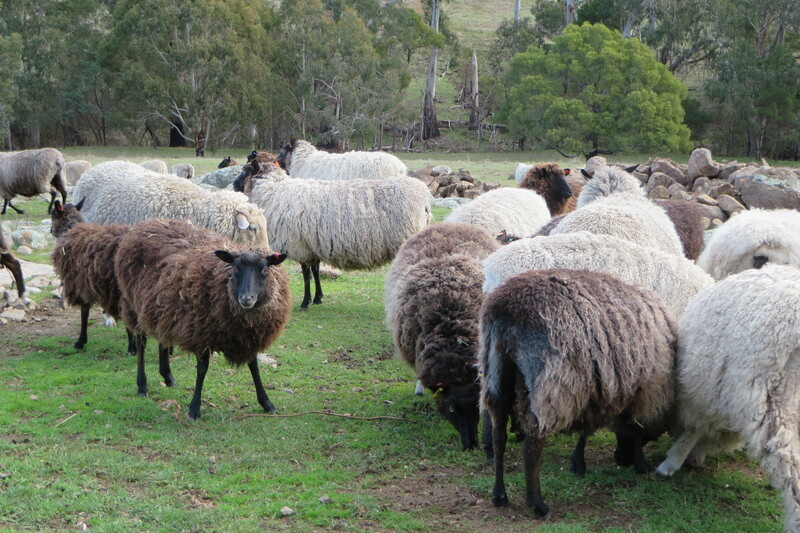 Wool is naturally coated with grease, which water-proofs the sheep and reduces moth attack. Pretty much all the wool we wear has been scoured to remove the grease, which can be processed into lanolin. Dust and mites can get trapped in its fibres, so wool isn’t always suitable for people with allergies. Wool is very durable. Wool is a fine fibre, usually ranging from 22-34 microns. Super fine Merino can measure less than 15 microns! Each fibre has little burs along its length, which is what makes wool scratchy to touch (finer wools are less scratchy). Fibre length ranges from 5-13cm. Wool for handspinning aims to be long because it’s easier to spin; longer fibres also make stronger yarn. 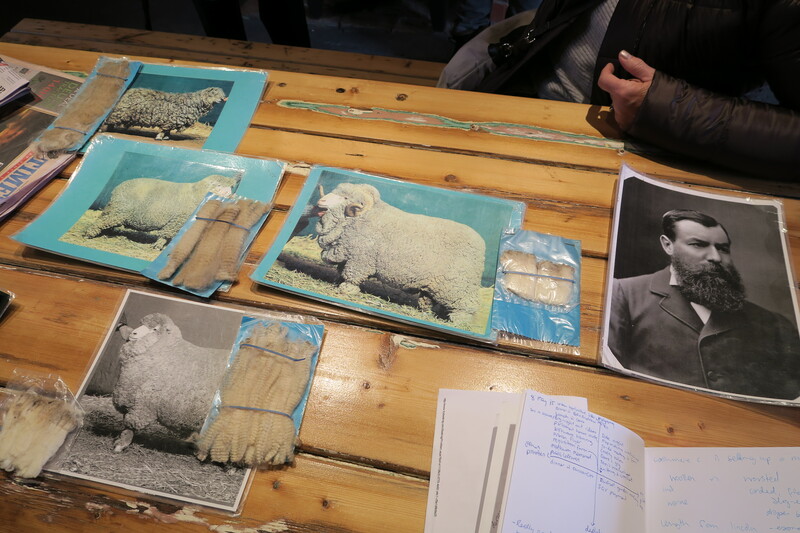 Some breeds have a wool with lustre, particularly if the end product is intended for crafters. Wool has a lot of crimp, which insulates by trapping air. The crimp also makes the fibre elastic, which gives garments good shape ‘memory’ and resilience. Wool keeps you dry by soaking up water. Its insulating properties mean wool gets warmer when its a little wet! 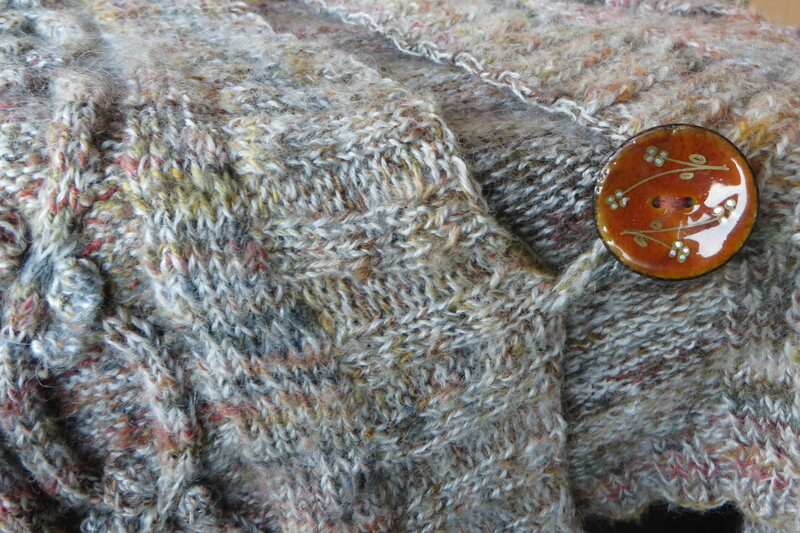 Wool has a lovely drape, but it does pill during use. Wool is a relatively inexpensive fibre. Wool is made into so many things, it’s hard to keep track. It’s woven and knitted into fabrics for fashion and home wear. Its used as building insulation and made into carpets, mulch pads and mattress stuffing. In Australia, most home wool production goes towards bedding products like doonas and mattress covers. Our fashion-quality wool is exported to mills in Asia and Europe.